India took a big step towards an operational two-tier ballistic missile defence system by testing a high-altitude interceptor missile to destroy an incoming ballistic missile over the Bay of Bengal on Saturday morning. 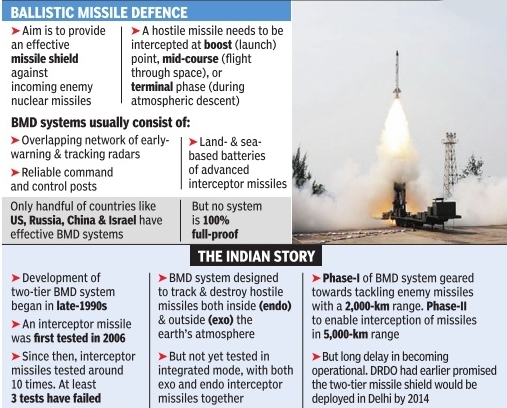 The Defence Research and Development Organisation was itself gung-ho about its long-delayed BMD system, claiming it would now be possible to deploy the two-layered missile shield to protect a city or strategic installation in two years. 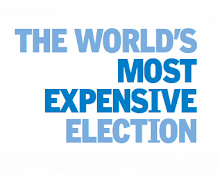 But it had earlier also promised that New Delhi would get the missile shield, capable of tackling missiles with a 2,000 km strike range, by 2014 at the latest. 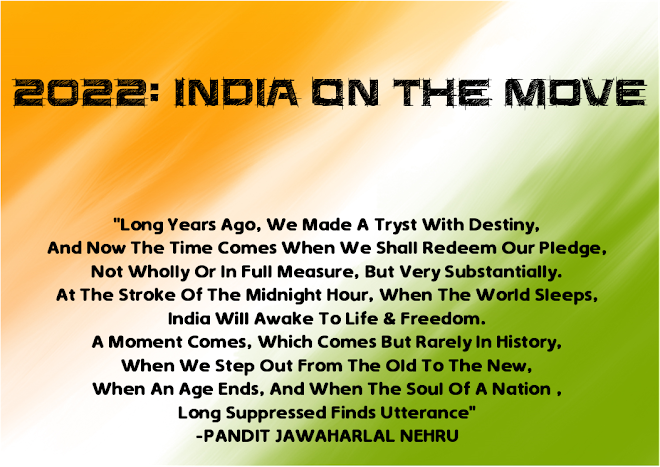 Scientists, however, say they are confident of achieving the target this time. 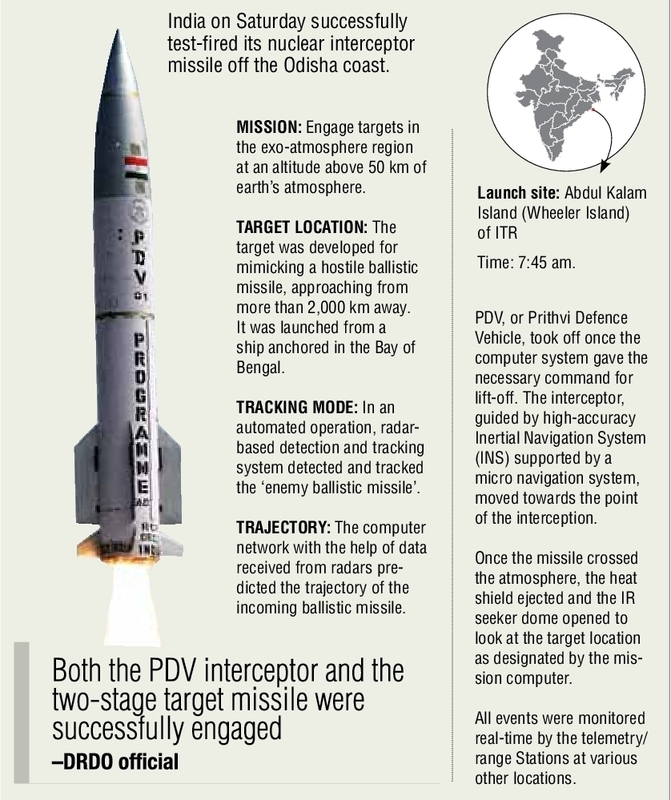 The “exo-atmospheric“ (outside the earth's atmosphere) interceptor missile tested on Saturday, also called the PDV (Prithvi defence vehicle), after all, directly hit the target missile at an altitude of 97 km. The test began at 7.45 am with the two-stage target missile, mimicking an enemy ballistic missile, being launched from a ship in the Bay of Bengal. 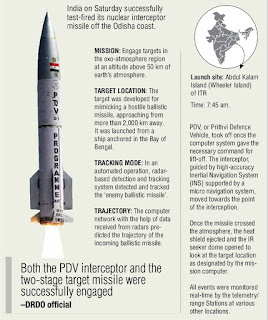 In the fully-automated operation, with long-range radars continuously tracking the target and feeding data about its trajectory to the mission computers, the interceptor missile was then fired from the Abdul Kalam Island (Wheeler Island), off Odisha coast, around 200 km away . BMD systems, of course, are highly complex to develop and deploy. 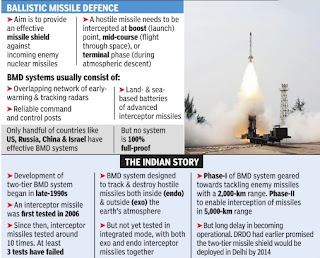 DRDO's experimental two-tier system is designed to track and destroy ballistic missiles both inside (endo) and outside (exo) the earth's atmosphere. A third layer, in turn, is planned to tackle low-flying cruise missiles, artillery projectiles and rockets in line with the overall aim to achieve “near 100% kill or interception probability''.